The 2012 drought disaster is now the largest in over 50 years, and among the ten largest of the past century, according to a new report released by the National Climatic Data Center today. 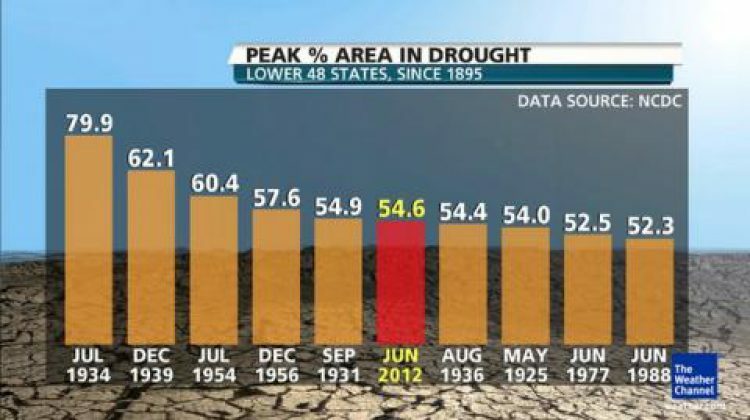 As The Weather Channel reported in an exclusive preview of the report Sunday, data computed from the Palmer Drought Severity Index shows that 54.6 percent of the contiguous 48 states was in drought at the end of June, the highest percentage since December 1956, and the sixth-highest peak percentage on record. When it comes to irrigation, we do have much better technology today than we did in the 1930’s. Hopefully that technology holds. So what do you think; are we headed to a repeat of the 1930’s?